Clathria prolifera is the only red or orange, branching sponge on the US West Coast. 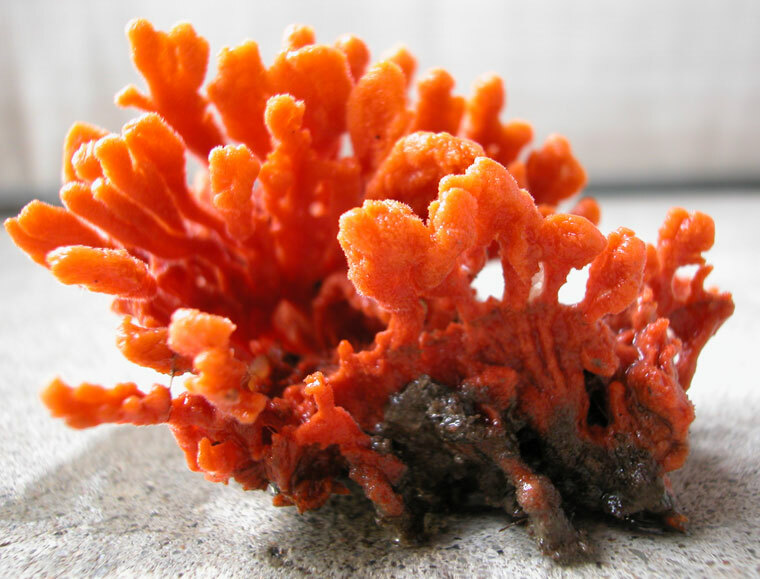 It grows out from an encrusting base in thin, finger-like, anastomosing branches that are about 6 mm in diameter, forming a bushy mass that can reach 20 cm in height. In some specimens the branches coalesce into undulating, drapery-like fans or walls. 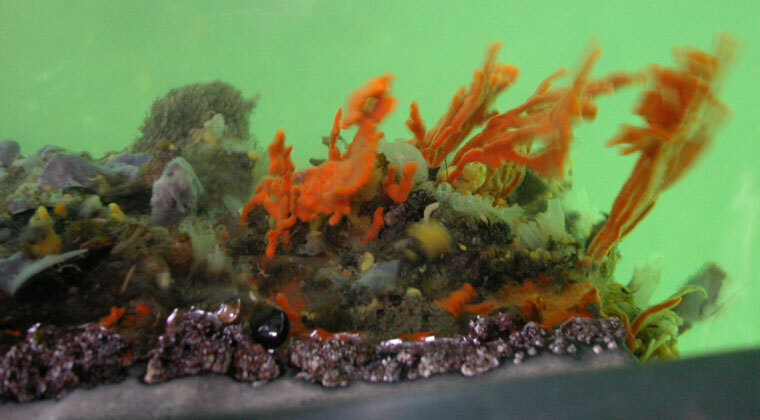 The encrusting base is less than 3 mm thick and may range from a few to 20 cm across. There are pores scattered over the surface through which water is taken in, but these are not visible without magnification. When Clathria prolifera dries out or is preserved, it generally turns brown. Clathria prolifera commonly occurs in bays and harbors in dock fouling and on the undersides of low intertidal and subtidal rocks, down to salinities of around 15 ppt. 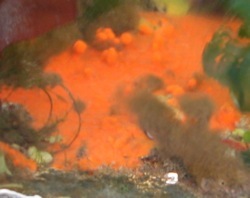 On the Atlantic Coast, larvae are released in summer and fall. They swim at surface for about a day, then crawl on the bottom for another day before attaching. 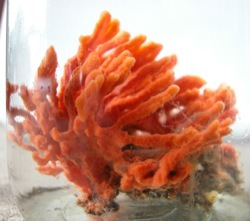 Young sponges consist of a thin encrusting layer only, and before branches begin to grow out may be confused with various related species (see below). On one occasion I found a native Pacific Coast sea slug, the orange-colored Rostanga pulchra, on Clathria prolifera in San Francisco Bay. This sea slug normally feeds on native orange sponges. 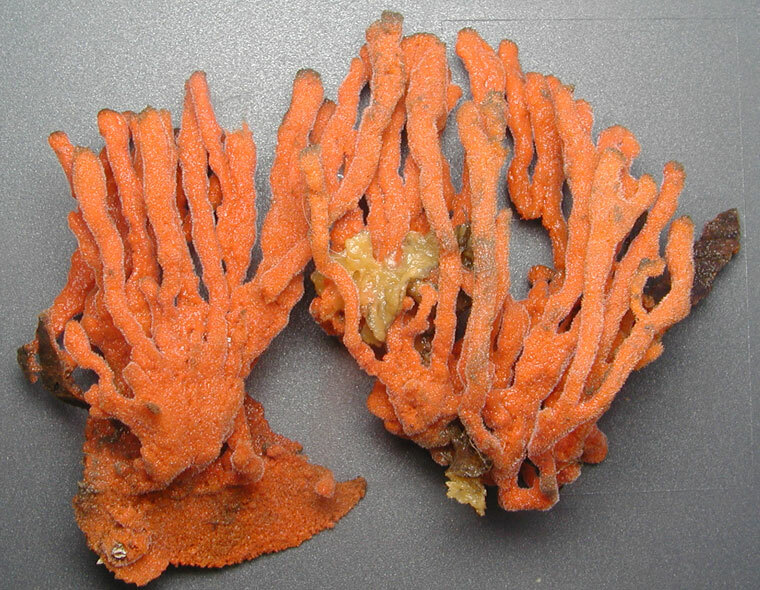 The finger-like branches or drapery-like walls of older Clathria prolifera specimens distinguish them from other red and orange sponges, but young encrusting specimens could be confused with several related species. Lee et al. (in press) list 13 red or orange encrusting sponges in California that are in the same suborder as Clathria prolifera (Clathria brepha, Clathria microjoanna, Clathria originalis, Clathria parthena, Clathria pennata, Clathria spongigartina, Clathria sp. Hartman, 1975, Antho lithophoenix, Antho lambei, Antho karykina, Antho illgi, Acarnus erithracus and Iophon rayae). An encrusting specimen that is thicker than 3 mm, has conspicuous pores or exhalant openings (sometimes with radiating grooves around them), or has a surface roughened by tubercles and ridges, would not be Clathria prolifera but might be one of these other species, which otherwise are distinguished from young Clathria prolifera by skeletal details that require microscopic examination (see Lee et al. (in press)). Also, many of these are outer coast species and not reported from bays or harbors, where Clathria prolifera occurs. Northwestern Atlantic from Prince Edward Island and Nova Scotia to at least South Carolina. Some authors also report it in Florida and the Gulf of Mexico. In San Francisco Bay, Clathria prolifera is found from the Point San Pablo and Richardson Bay in the north to San Leandro and Redwood Creek in the south, but not near to the mouth of the bay. Although the earliest preserved specimen that has been located is dated 1953, Willard Hartman noted that it had been photographed in San Francisco Bay in the 1940s. In an experiment in the 1950s, Hartman transplanted colonies from Redwood City to Berkeley, where it is now established. Clathria prolifera was first seen on the Pacific Coast in San Francisco Bay in the 1940s. It is common in Atlantic oyster (Crassotrea virginica) beds, and could have arrived either as a late introduction in oyster shipments or in hull fouling. Carlton, J.T. 1979. History, Biogeography, and Ecology of the Introduced Marine and Estuarine Invertebrates of the Pacific Coast of North America. Ph.D. thesis, University of California, Davis, CA (pp. 215-216). Cohen, A.N. and J.T. Carlton. 1995. Nonindigenous Aquatic Species in a United States Estuary: A Case Study of the Biological Invasions of the San Francisco Bay and Delta. U.S. Fish and Wildlife Service, Washington, DC (pp. 30-31). Lee, W.A., W.D. Hartman and C.M. Díaz. In press. Phylum Porifera. In: The Light & Smith Manual: Intertidal Invertebrates of the California and Oregon Coasts. J.T. Carlton (ed. ), University of California Press, Berkeley and Los Angeles. Morris, R.H., D.P. Abbott and E.C. Haderlie. 1980. Intertidal Invertebrates of California. Stanford University Press, Stanford, CA (pp. 27-28). Two orange specimens of Clathria prolifera from San Francisco Bay, with a yellow sponge (Halichondria bowerbanki) growing on one of them. Another orange Clathria prolifera from San Francisco Bay. Clathria prolifera growing out from the side of a dock in San Francisco Bay. The “undergrowth” includes translucent sea squirts (Ciona savignyi) and yellow and blue sponges. Another Clathria prolifera on the side of a dock in San Francisco Bay. 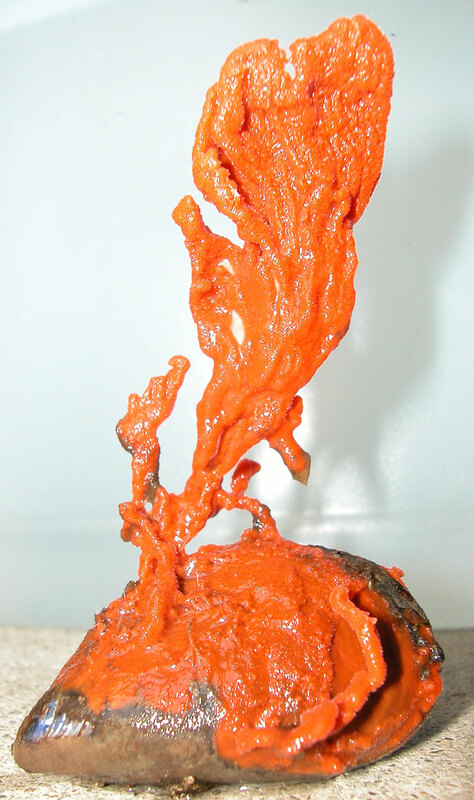 This one is mostly encrusting, with branches just starting to grow out. Clathria prolifera from San Francisco Bay, showing several rows of branches coalescing into walls. Clathria prolifera growing on a bay mussel (Mytilus trossulus-galloprovincialis complex) from San Francisco Bay. 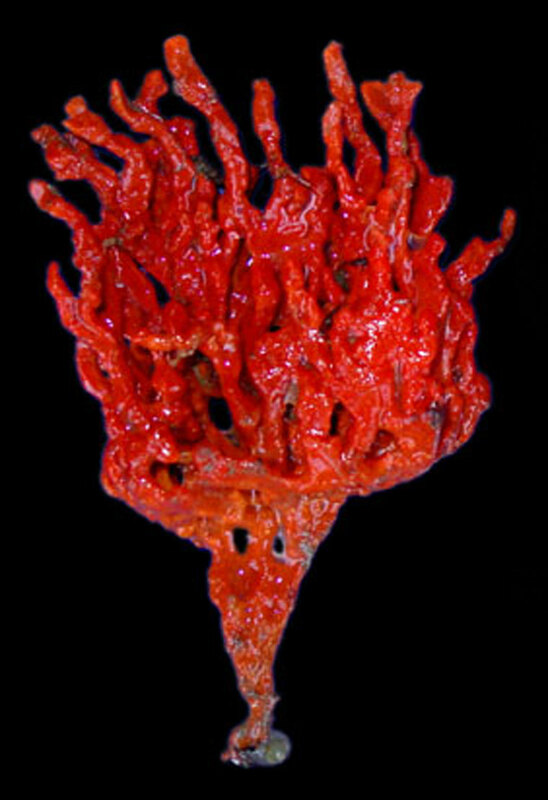 A red specimen of Clathria prolifera from San Francisco Bay.